This series, Cooking in a Hotel Room, is designed to show you how easy it can be to prepare quick and easy meals on the go. To some, vacation is a great time to explore new destinations and that may include eating food and experiencing flavors that may be new to you. That’s not the case for my family. Though we do try new restaurants on occasion, we prefer to eat home cooked meals whether we are on the road or not. While I prefer to prepare our own food while we’re traveling, I don’t want to spend all of my time and energy cooking when we are often running around, trying to see as much of the area as possible. 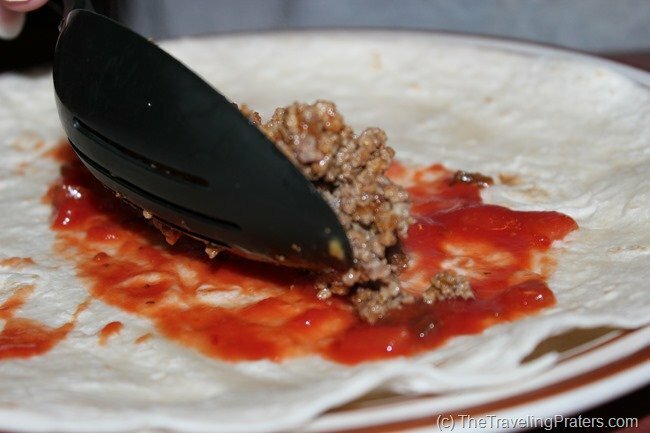 Over the years, I’ve found several quick and easy hotel meals that take minutes to prepare. 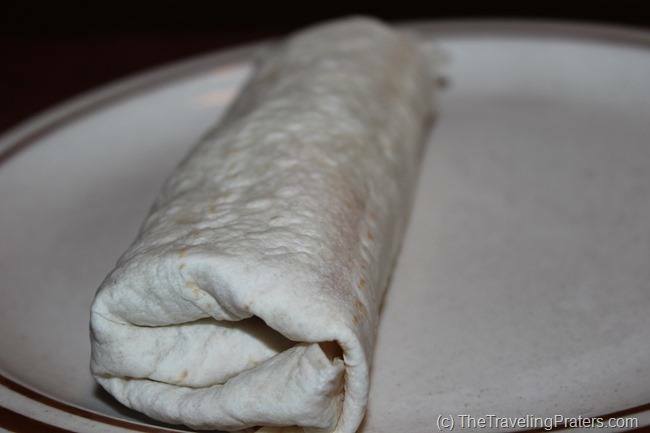 This beef and bean burrito recipe is one of my go-to recipes. Brown your hamburger. 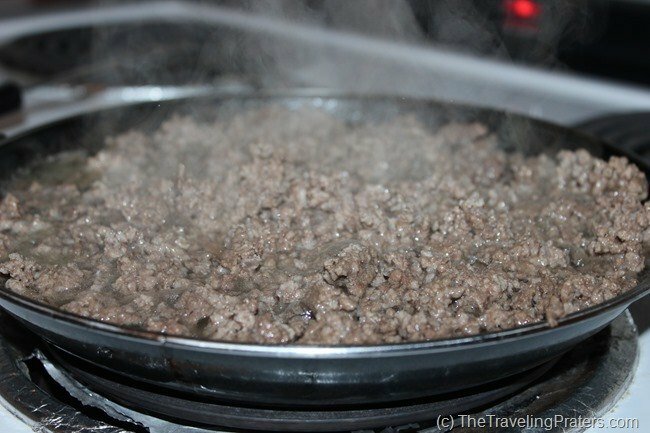 While I always try to reserve lodging with kitchenettes and a cook top stove, it is possible to brown hamburger in a crock pot. 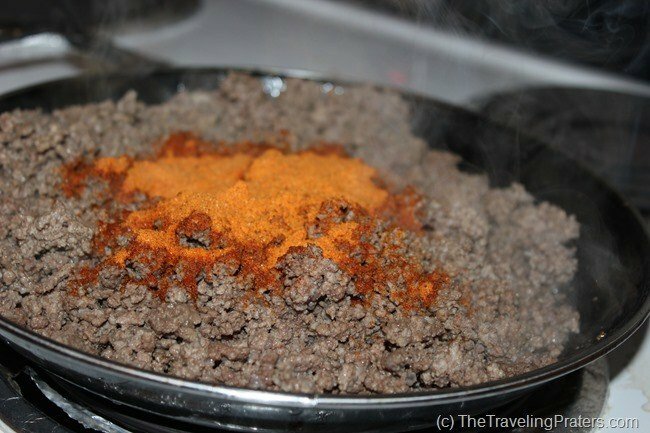 Drain the hamburger and add taco seasoning as per directions on the package. While many hotel rooms with kitchenettes offer basic kitchen supplies, I tend to pack a few supplies of my own. My on-the-go- portable kitchen includes a can opener, a collapsible colander and collapsible measuring cups. 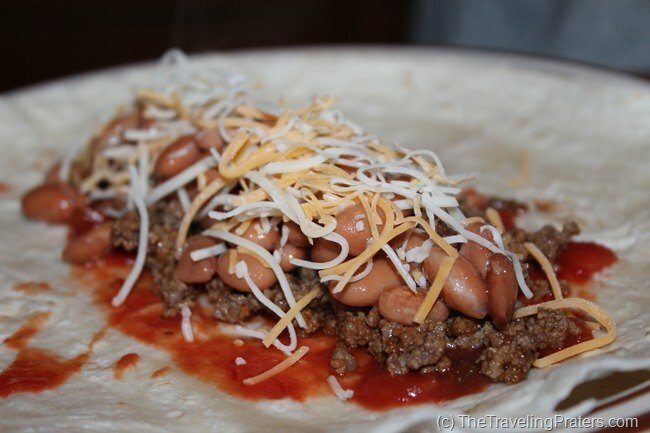 Next, open the beans, drain and add to the hamburger to heat through and heat the flour burritos in the microwave. 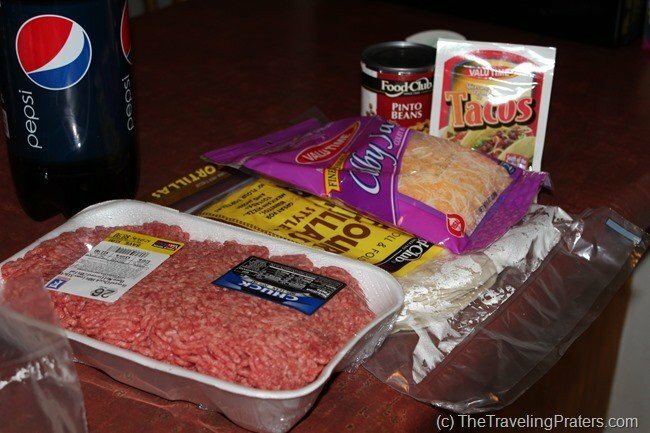 Begin to layer the ingredients on the burritos. Roll them up and eat. Yum. Pair the burritos with some tortilla chips and salsa or a light salad and you’ll have a delicious meal in under 30 minutes. Do you prepare your own meals when you travel, enjoy dining out or a combination of the two? 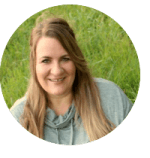 This post is linked to Inspire Me Wednesday with Mama Buzz. © 2013, Tonya Prater. All rights reserved. Just discovered your “Cooking In a Hotel Room” series and I love it! Great to see you sharing how simple it is to save money on the road by eating in more often than eating out. Do you bring certain cooking pans/pots and equipment with you? Or do you always make sure to find out what the hotel will have in the kitchen before you head out? I have to agree with Sonja, totally impressed. I ALWAYS eat out when we travel, but I so wish we didn’ted. Pinned so I can remember this for our next trip! 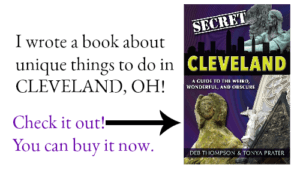 We’ve traveled so much with my husband’s job that we actually got tired of eating out. I don’t think my husband would travel as much if I didn’t prepare most of our meals on the road. We had Easter dinner in a hotel room once. We often try to pick hotels with kitchenettes so we can cook in for some of our meals. Usually we stick to breakfast and lunch, but this looks like a good one! I’m impressed with your in room cooking. I never do this…always eat out!